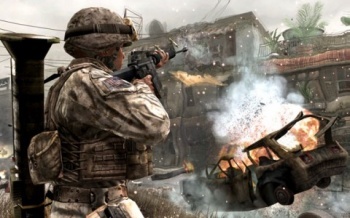 The next chapter of the Modern Warfare will be on shelves by early Spring 2012, says Janco Partners analyst Mike Hickey. After the upheaval at Infinity Ward earlier this year, Hickey thinks that the studio will be in no fit state to make Call of Duty: Modern Warfare 3. Instead, he thinks that role will fall to the latest addition to the Call of Duty development family, Sledgehammer Games. In a research note released today, Hickey wrote that believed Modern Warfare 3 would be released by the end of Activision's 2011 fiscal year, meaning some time before March 31st 2012, and could sell in excess of eighteen million units. He also thought that an online only Call of Duty game would launch in China, also before the end of March 2012, and that Bungie would release an MMO in the following fiscal year. It's certainly possible that Activision could hand over development duties on Modern Warfare 3 to another studio, but whether it's going to be Sledgehammer is another matter entirely. If the torch does get passed, giving it to a brand new, unproven studio, with a background in third-person adventure games, rather than first-person shooters seems like a rather risky proposition. It seems a lot more likely that Treyarch would be given the task, having produced several Call of Duty games already.